Nothing like Cuba – but more to come on that! Just a little something from Ontario – The water is cold and the tunnels black. I had the experience a few years ago of dredging out a sumping tube somewhere near Hamilton – where the temperature on the surface was many degrees below zero and I had to submerge myself up to my neck in this horrendous muddle puddle to scramble away with my hads to try and loosen the boulder that was blocking our way. It took us more than one visit to the location to clear our route and even so – beyond that the tunnel did not go on that far – but what a rush when we broke through. Caving in the tropics is much more spectacular than what we are used to up here, but still, in Ontario you need a special kind of dedication; it is a pursuit that sometimes leaves you wondering – What is wrong with me? Here I am just feeling the atmosphere. The cave is not so big, but it leaves one with the hope of something else further up the stream. I am yet to investigate. Sloshing through tepid water in the Cuevas de Bellamar I proceeded onwards past the usual path of travel. I am told that these gently sloping tunnels eventually reach the aquifer. Cuba is part of the same limestone plateau upon which is perched Florida and the Yucatan. Oddly this rock in which the Cuevas de Bellamar has formed is reddish – like what you would expect to see on mars and the calcite that has precipitated from within is snowy white – like icing. P1010096, originally uploaded by Mic2006. I think it might be that one evil green eye that led me on beyond the tourist designated tunnels of the Cuevas de Bellamar. 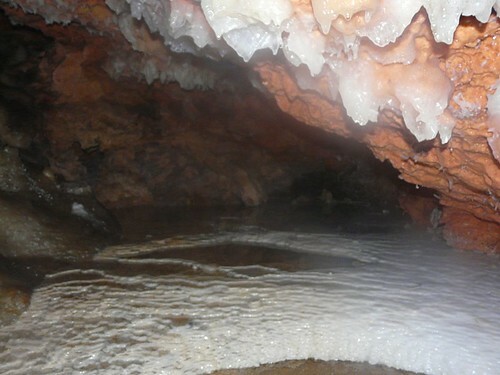 I had been given permission to go further by our guide who was an avid caver himself. I still intend to produce an article for a magazine or something about the experience – in fact I have it produced already. 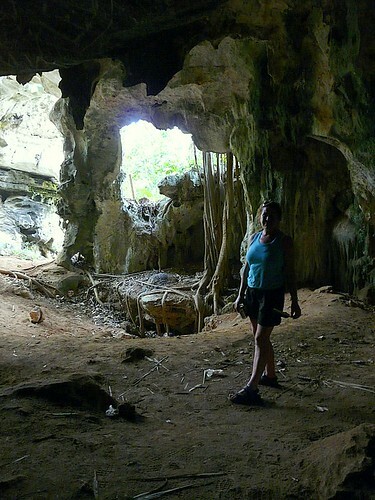 Toronto Star had initially suggested that they would be interested in seeing something on Cuba’s caves but that fell through. As you can see by my wrist band I was at that time resident at one of the Island’s many tourist resorts (Jibacoa). We had picked a quiet place half way between Havana and Varadero – it was beautiful, but the food – Wow, you cant begin to imagine the spagehetti paste filth they served and called it food -stay away from the fish as well, but conversely, some stuff was still edible. The people, now they were great! 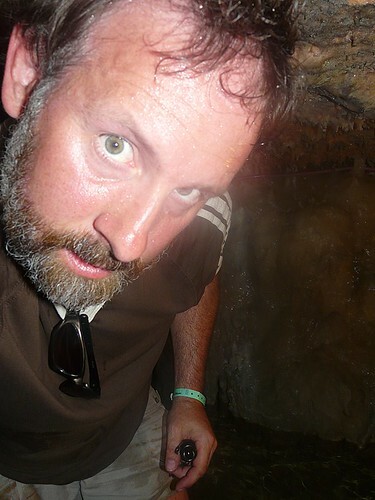 Anyway, here I am sweating off the beer from the night before and wading along in tunnels that were just incredible. 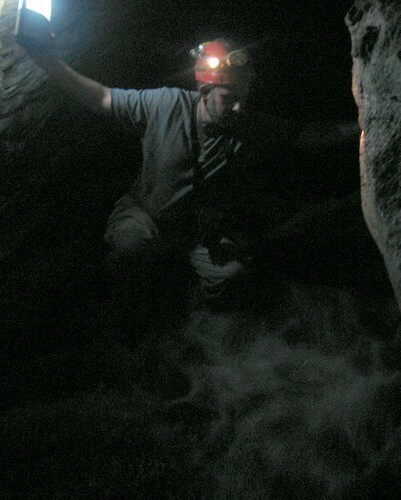 More pictures to follow soon – please excusee the lack of caving gear, my exploration was kind of winging it, the guide had lent me his little pocket light. I should be getting back to my essay, I’m supposed to be writing something on health and safety legislation – I’m doing a course in Conestoga taught by a MOL inspector. Pulled off a pretty decent mark on my test – you might remember that I mentioned avoiding it by blogging about my last trip to Dodge. I’m heading back to Kansas for a health and safety conference in Janurary. P1000524, originally uploaded by Mic2006. Sea caves usualy form along weaknesses in the rock that are scoured out by ocean waves – they seldom go to far in, but surprisingly, they often have secret little passages at the back of rather cavernous entrances; I can think of several such instances along the Bruce peninsula and one quite close to home (Guelph). Here we are way up in the hills in Cuba – having spent an unusual day with our host – M…, who speaks no English and we no Spanish beyond “Mucho Gusto” and “Por Favor”. The Cuban people are exceedingly generous with what little they have and several times that morning M… stopped and bought us beer. We even smoked a cigar between us that left me retching and dizzy. No complaints except the single handle that we passed around to roll down the various windows in the car. Occasionally we pulled them back up at checkpoints so as to remain hidden from authorities; they frown on connections between the locals and visiting tourists – in case we spread our degenerate Western ways. I think we were somewhere in the middle of Matanzas Province, quite high up, and off in the distance there were sugar cane fields that disappeared beneath a vista of yellowish-haze. Underground, within these chambers roots broke through the roof and crept across boulders like tentacles. “Maggie was excited and wandered off into places that you could not see. Being a caver I was curious, but also cautious, as I had seen a pit on the walk up and wondered if there was any such feature hiding in the darkness. There was a sign at the front of this cave – written in Spanish and interpreted by M… who with his hand actions indicated that some kind of battle had taken place here. If you can read Spanish I have a picture of the sign in my Flickr account. P1000527, originally uploaded by Mic2006. 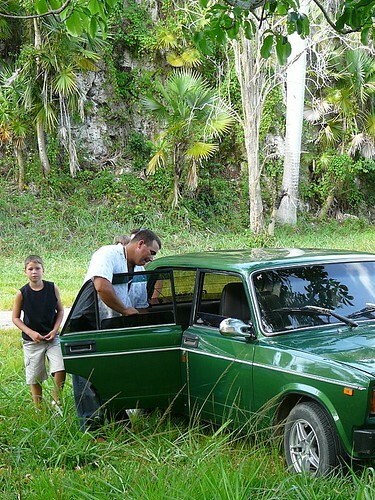 Here we are – cruising in the smoking Lada with M… and family. We are at a place called “Escaleras de Juruco” here to see the caves! As my diary records, ” M… drove us further into the park, thrashing the Lada through the grass and from where he parked we walked along a path in extreme karst pavement, the ground an eroded knot on rock and crevices. We were soon upon several limestone openings – quite obviously sea caves now left high in the hills amongst the palms. Roots hung through the rock and wound over boulders – further in – deeper into the caverns the airflow seemed to stop. I assumed they went nowhere. Faceted and rough corundum crystal, originally uploaded by Mic2006. This is what ruby and sapphire looks like in their rougher forms. They are hexagonal crystals, generally displaying a six sided shape and in the case of the cabbed ruby in the fore-ground, also showing some pretty obvious hexagonal zoning. Zoning indicates the placement of the rough crystal faces as the crystal grows. There is a continuum between corundum and sapphire, both are of the chemical formula aluminum oxide, its just the quality of the crystal that dictates whether it will be a gem or a mineral specimen. 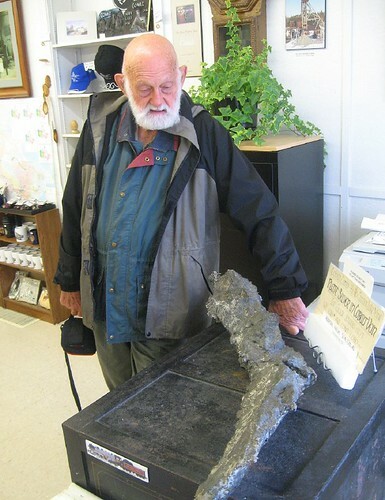 I found the blackish crystal encased in calcite at the Faraday Hill road cut near Bancroft; only the tip was protruding from the rock and I roughly chipped it out and dissolved the calcite from it using Coca Cola. 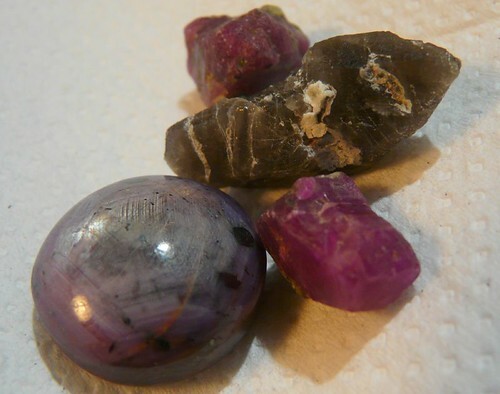 The two rough reddish crystals are Mysore Rubies from India – not woth much at all and the cab is also from India, I bought it from Sahib for a couple of dollars – its way to opaque to be of much value but I liked the way it showed the zoning so clearly.